A small box, large enough to hold a penny is passed out for examination. A penny’s date is noted and the coin is marked by a spectator with a scratch, felt pen or whatever, and placed into the box and snapped shut. The box is held by a spectator. 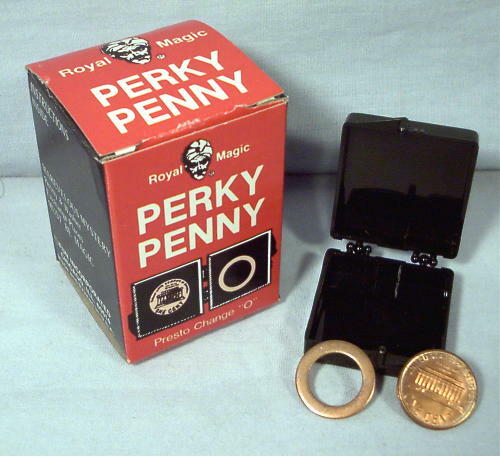 A small penny sized hardware washer is shown and placed into the magicians pocket. A few magic words, and PRESTO! The penny and the washer have exchanged places. The marked penny is now in the magicians pocket and the washer is in the snapped shut box in the spectators hand. The penny in the Magicians pocket is the same penny the spectator marked! Impressive pocket trick! Clever self contained apparatus fits in a vest pocket. With a little practice this trick can be easily mastered. Astonishing effect! This one will fool magicians. Interesting pocket trick can be used as an ice breaker at a dinner table or business lunch. Quality made by Royal Magic. We bought out an old Trick and Novelty shop. This item is typical of stuff in the large Dime Store merchandise finds we made. If you like vintage Dime Store and Variety Store stuff, bookmark us. We pack it securely and send it First Class U.S. Postal. It's Royal Magic so you know it's good! Notice : This item is a genuine vintage toy from an era when there were no safety standards. It probably contains, or is, a choking hazard, and probably includes other features that are not suitable for children to play with. It is not being sold as a toy for a child to play with, but as a genuine vintage collectable item for adults.